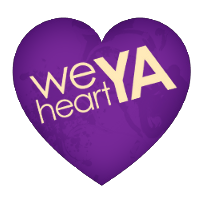 We Heart YA: John Green: Author or Rockstar? Yes, concerts. Well, sort of concerts. Part concerts, part readings, part puppet shows... It's an odd but wonderful mix, and I had the privilege of watching it live on the internets. 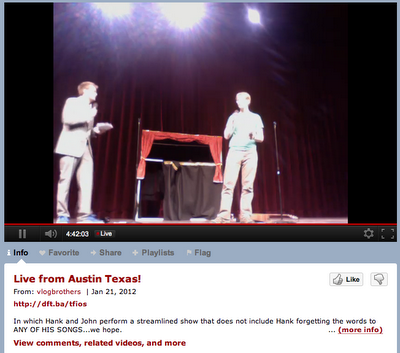 John and his brother/co-vlogger Hank are on tour, and they're streaming some of their events on YouTube. There are only 3 more events, so keep an eye on John's Twitter feed for details on how to attend/view. Actually, most of their tour has sold out. Yes that's right, HUNDREDS (in some cases at least a THOUSAND) people paid to see John and Hank be goofy for a couple hours. Needless to say, this is not your average book tour. But after reading John's latest, The Fault in Our Stars, and then watching him and Hank live on YouTube, I started to get it. No wait, that's a lie. I FULL OUT get it. I am a NERDFIGHTER. John is funny. John is smart. John is honest. AND SO IS HIS WRITING. I don't mean to sound like a gushing fangirl, but I have a tremendous amount of respect for those 3 qualities. 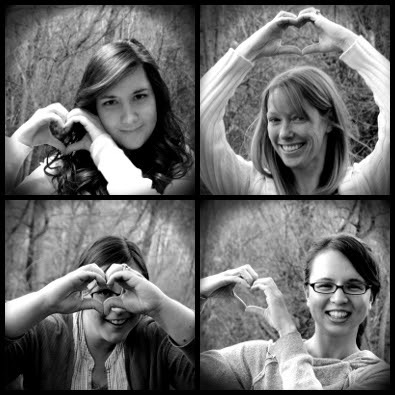 I aspire to them myself. And though I may never be a vlogger, or sell out 1000+ seats on my book tour, there's a lot I think I can learn from John Green, both as a writer and as a human being. "Even the biggest lives are temporary." John wanted to write a book about "the small heroism" that most of us will have to choose. Being aware of our mortality "helps us use our time here wisely." Re: his characters being so intelligent/eloquent -- (paraphrased) First of all, yes, he really does believe that there are some teenagers that smart and eloquent. Not many, but some. And second, fiction doesn't need to pretend not to be fiction. He doesn't consider it his job to present a technical reality or to stick to what's "common." Obviously. After all, he wrote a book about a guy who dated 19 girls all named katherine. "That is not common." Re: Markus Zusak (author of The Book Thief) -- "He's like the nicest guy, and a genius, with big muscles... It's very frustrating." PS: I don't mean to snub Hank. Hank is great too! He's sort of the concert-y part of the concerts. Which is obviously key. Totally love John Green! It's awesome that you got to check out his concert live online :) I've only read Paper Towns but I'm in love with his writing already. Need to get my hands on The Fault in Our Stars. Everyone's been gushing about and me = very very jealous :P great re-cap of the event! I love Markus' comment about him...that's awesome! And another plus about John Green, he went to Kenyon! That's why the writing vibs are so awesome there! Rockstar Author. I'll never forget how Steph and I stumbled through the side entrance into an auditorium of 300! We mistakenly assumed it would be just a small gathering...and then the 2 hour line for the 20 second, "Hi. I love your books." "Thanks." I've heard great things about Paper Towns. That or Alaska will probably be my next JG read. If I can, I TOTALLY will see him in person. I feel silly now that I didn't join Sarah and Steph when they went to Indianapolis for him. The Greens!!! def. rockstar status Just finished TFIOS, which i absolutely loved. I wish i could have met them @ the signings!!! wait i wouldn't know what to say lolz!